As many of you know, I am a huge Judy Blume fan. I loved her books as a child, but now that I'm re-reading many of them for the Shelf Discovery Challenge, I realize just how amazing she truly is. I am on a big Judy Blume kick right now because my good friend Kathy (aka Bermuda Onion) is hosting a Shelf Discovery/Judy Blume Mini Challenge this month. 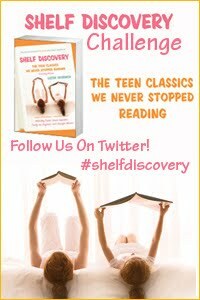 Please check out her announcement post because she is giving away some awesome prizes -- plus it's JUDY BLUME! So a few days ago, I requested from the library all of the Judy Blume books mentioned in SHELF DISCOVERY that I don't already own. The first one that I dug into was DEENIE, a book that I read numerous times as a pre-teen. I remember devouring this book and feeling so much pain for Deenie. Deenie is the story of a beautiful young girl whose mother has her sights set on a modeling career for Deenie. When Deenie is diagnosed with scoliosis and has to wear a brace for four years, she is absolutely devastated -- what girl wouldn't be? It's how Deenie manages to deal with her diagnosis that makes this book so very, very special to me. When I think about it now, I realize that as a child, I probably liked this book because of Deenie's character. I think many of the finer points of this story were way over my head, but I liked it nonetheless. Now that I'm a mother myself (and more mature), I see how wonderful this book is on so many levels; however, I still think that the reason I loved this book so much now is because of Deenie and how much she evolved in just 140 pages! Of course my heart went out to Deenie because of her diagnosis, but I think I actually felt bad for her much earlier in the story this time around. As a child, I missed out on Deenie's mother and the pressure she put on Deenie and her sister -- Deenie was the beauty and her older sister Helen had the brains. She labeled each of her girls and put them in a box -- how I hope I never do this to my kids! When Deenie believed she could no longer be a model because of her scoliosis, she not only had to deal with the news of her diagnosis, but she also had to deal with not living up to her mother's expectations. Thank goodness, Deenie was able to realize that she had much more to offer than just a pretty face -- she began to think that maybe she could someday be a doctor. I also was absolutely amazed with how Deenie's mother handled her scoliosis -- thank goodness for Deenie's father whom I absolutely loved. He was compassionate yet firm when Deenie didn't want to face her peers with her new brace. Deenie's mother, on the other hand, couldn't handle her diagnosis. She was, in almost every way, more immature than Deenie. She put her dreams for Deenie ahead of Deenie's welfare, and she wasn't strong and supportive when Deenie needed her the most. I guess she could only handle so much; but as a mother, I was mortified by her behavior. Another thing I really liked about Deenie was how her attitude towards others changed after she was diagnosed with scoliosis. I don't think Deenie was ever mean towards others, but she did shy away from Barbara, a schoolmate who had eczema and Old Lady Murray, a storekeeper who had a hunched back -- pretty normal adolescence behavior, right? She realized that she now had something in common with these people, and she became much more compassionate towards other. She even wondered if her neighbor who had a disability was just "a regular girl like me." I absolutely melted at the end of the book when she let Barbara help tie her shoes, and then grabbed her hands (eczema and all) to be partners in gym class. Needless to say, I loved this book both as a child and an adult. I highly recommend it!!! If you haven't seen Lizzie Skurnick's essay on DEENIE in SHELF DISCOVERY, it's a must-read. She summed this book up perfectly, and I almost feel as if anything I say is either unoriginal or redundant. Her words are so eloquent about Deenie and her actions! Note: There are a few different covers for DEENIE, but I actually read the version of the book that is pictured above. Wow! Now that's a powerful book to have had such an impact on you when you were young and to have held up to your adult rereading. I haven't read this one. I read this exact one as well when I was young. Like you, I read it over and over, and it put the fear of God in me. I guess I never really knew when we would be tested for scoliosis and didn't have a chance to freak out (had I known when it was coming, I would have), but when I WAS tested, I thought I would throw up. This book packs a wallop if you are a young girl, that is for sure! Boy, does that sound good! I'm wondering how I missed all of these books as a child! I should read this one. My niece had to wear one of those braces for years and now she is a lovely young woman, but it was hard for her and made her very shy! Amazing how the book affected you when you were younger. I remember the scoliosis tests. I never read this one. Somehow I missed it so I picked it to read for the challenge. After the awful one I read, I should read Judy Blume next! Judy Blume rocks! Isn't it funny how affected we are as young teens by our worst imaginations - and sometimes in real life too! I read this book as a pre-teen and it also made me scared to be tested! This is one of those books that's so special, I'll never forget it.